VIERA, Florida -- In a contentious discussion regarding the merits of funding a North Brevard Enterprise Zone with property tax and tangible tax waivers during last night's Brevard County Commissioners' meeting, Commissioner Trudie Infantini walked out of the meeting after fellow Commissioner Robin Fisher took a personal jab at Infantini. 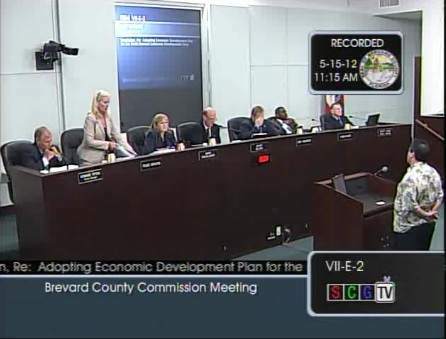 While discussing the financial numbers and the impact of the Enterprise Zone on the rest of Brevard County, Infantini said, "I know its going to create in excess of an $82 million hole when it was just based on real property, but when you factor in tangible property, that number goes up to over $92 million, and that's based on Department of Revenue data...over a 30 year period, that's over $92 million dollars. I know I was called a liar and told that I was throwing out bogus numbers when I said $70 to $100 million, but the low estimate is $82 million. Now its probably $82 million to $200 million. "It doesn't raise taxes on anybody, it doesn't create a hole, and it doesn't create the need for additional services," said Commissioner Chuck Nelson. "If you have five people go out and have a $10 lunch, that's a $50 bill, now if one person says they don't have their wallet, that's $50 divided by four people. So four people will now pay $12.50," Infantini said. "Well, in the economic zone, that $10 tax, but we are going to call it a dinner bill, went from $10 per person to $12.50 per person. The person in the economic zone will also be paying $12.50 because whatever tax is assessed on those four people will be taxed on the people in the zone. The people in the zone will also be paying a higher amount of tax." "That analogy makes no sense," said Nelson. Commissioner Andy Anderson said, "I know there is a Certified CPA on the floor. Can we move his card up? I'd like to hear another CPA's take." "A real CPA? [implying that Infantini is not a real CPA]" Fisher asked, then chuckled. "They are both real CPA's," Anderson replied. "Oh that's funny. You know people say that I'm argumentative. You're the only one who name calls... In Robert's Rules of Order, is this appropriate behavior? Is there anybody that is suppose to be monitoring the actions of the Board? Or is this name-calling thing going to continue on?" said Infantini. "Because if it is, I'm going to walk out. Frankly, I've had enough of this. You know what, you can have this meeting, Robin. You are out of line."